With over 35 years of primary medical experience, Dr. Naguib Bebawi manages Advantage Plus Medical Center. Centered in Irvine, Dr. Bebawi specializes in Family Medicine, Occupational Medicine and Addiction Medicine. We made to highlight the cutting-edge services and technology Dr. Bebawi uses on his custom website. We went with a full-width design layout to ensure that the site would come off as modern and classy. As web-visitors enter the website, they are promptly greeted with smiling faces from our parallax smile gallery. This also gives the impression that Dr. Naguib is approachable and friendly. We also highlighted the different services offered at the office. We rounded out the homepage with a call to action with a form to schedule a consultation with Dr. Naguib himself. We complimented the imagery through the use of a black and white color theme. When used together, blue and white make for a contrast that is action oriented. White provides the optimal background for educating and informing incoming patients. Having a white background also adds credibility to any professional medical website. Blue is primarily used to highlight calls to action throughout the website while also helping soothe the readers by giving a sense of hope. When designing any website, you want to make sure that the images on the website match the specialty at hand. 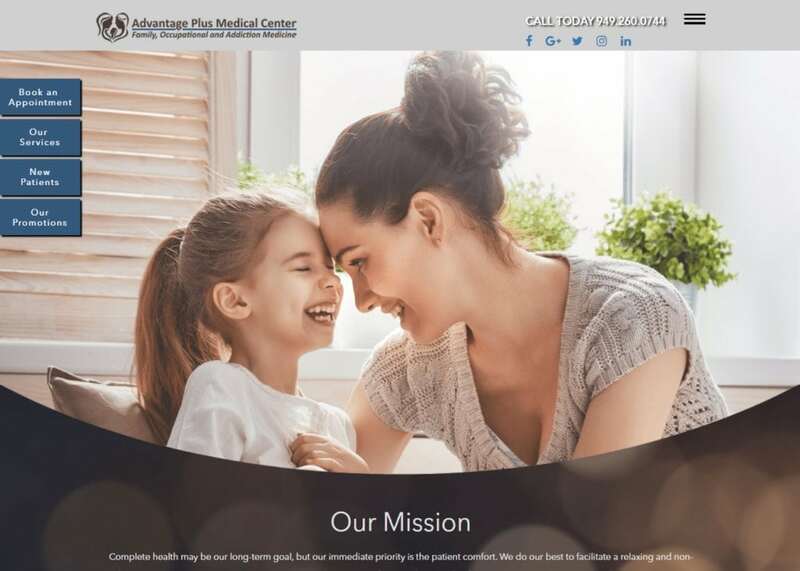 All the images on the website give the impression that Advantage Plus Medical Center is credible and trustworthy. One standout feature on the website is the lack of a traditional navigation menu. In its place is a hamburger menu. This allows more interface space for the readers as well as opening up the top banner for contact information and social media links. The patient questions tab is essentially a large FAQ page that hopes to answer any and all patient questions. As you move down the tab, you will notice a tab dedicated to testimonials. This is a great way to attract new patients as well as giving your practice a boost in reputation. Being personable is key to establishing any new patient-doctor relationship. The services page is home to a plethora of information. Here, readers can learn more about the different procedures offered. When you click on any of the procedures specifically, you are redirected to another page that describes the procedure in more detail. Dr. Hubbard understands that dental work can be quite pricey. As a result, he offers in-house promotions and online coupons as well. Just visit the promotions tab under the hamburger menu to find out more. Not only does this show compassion and understanding, but this can also help add a layer of personability and credibility to the dental office as well. Establishing the patient-doctor relationship early on is crucial to bringing in both new and returning patients.